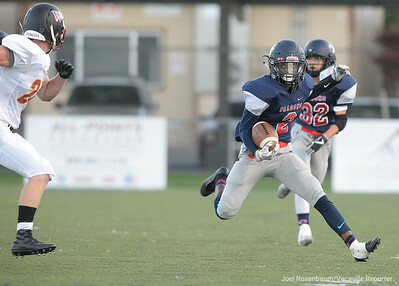 Vacaville Christian High running back, Tamani Williams busts through a big hole as he sprints to the end zone during the first quarter of the Falcons, 41-10 rout of Foresthill High School in non-league action Friday at Falcon Field at Vaca Christian. Williams ran for 181 yards and three touchdowns in the victory. 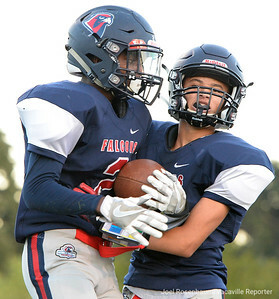 Vacaville Christian High running back, Tamani Williams celebrates his first quarter touchdown with teammate, Kendall Allen. 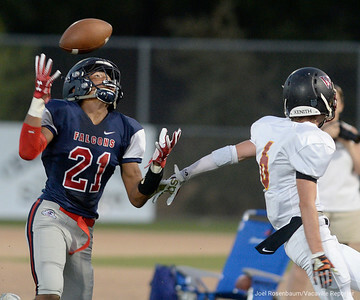 Vacaville Christian High defensive back, Tamani Williams heads upfield after he intercepted a pass during Foresthill High School first possession of the game. 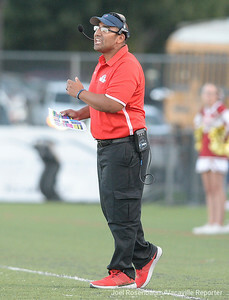 Vacaville Christian High School head football coach, Manny Tarango calls out to his players during the first quarter of the Falcons' 41-10 rout of Foresthill High School Friday at Falcon Field. 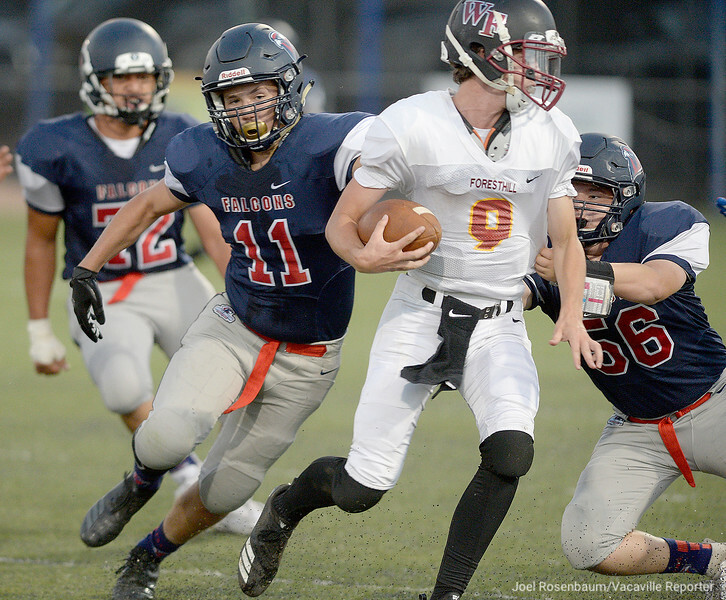 Vaca Christian High's Hawkin West (11) and Dimagio Carey track down Foresthill High running back, Nick Lechner during the first quarter of the Falcons 41-10 rout of the Wildfires Friday at Falcon Field. 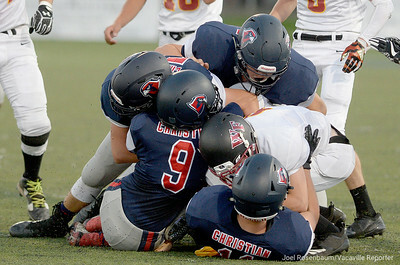 A host of Vacaville Christian High defenders smother Foresthill High School quarterback, Kaiden Pennington behind the line of scrimmage during the first quarter. Vaca Christian High's Hawkin West (11) and Zach Mercado track down Foresthill High quarterback, Kaiden Pennington during the first quarter of the Falcons 41-10 rout of the Wildfires Friday at Falcon Field. 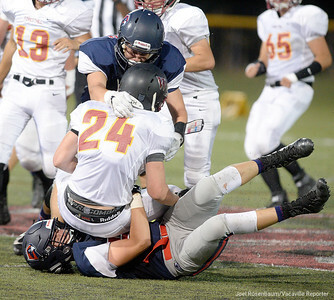 Vacaville Christian High School, Jaron Leaks can’t haul in the ball as he battles Foresthill High School safety, Cole Moore for a reception during the second quarter of the Falcons’ 41-10 rout of the Wildfires in non-league action Friday at Falcon Field. 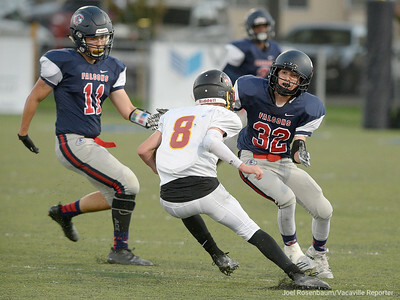 Vaca Christian High linebackers, Bryce Pazdel (bottom) and Chris Lespron sack Foresthill High running back, Caleb Westphalen during the second quarter of the Falcons' 41-10 rout of the Wildfires Friday at Falcon Field. 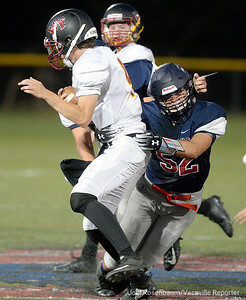 Vaca Christian linebacker, Bryce Pazdel wraps up Foresthill quarterback, Kaiden Pennington for a sack during the second quarter. 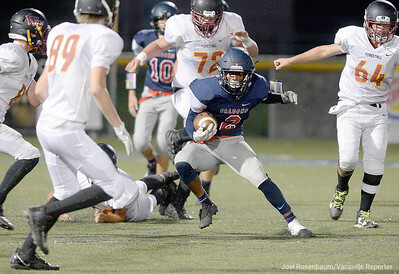 Vacaville Christian High running back, Tamani Williams busts through a big hole through a host of Foresthill High School defenders as he sprints for an 81-yard touchdown run during the second quarter of the Falcons, 41-10 rout of Foresthill High School in non-league action Friday at Falcon Field at Vaca Christian. 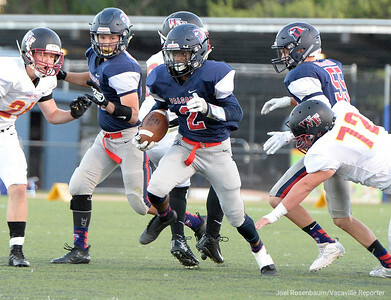 Williams ran for 181 yards and three touchdowns in the victory.